Decorating for many is an unparalleled passion. Magazines, websites and blogs gain attention from many people who have a decorating hobby and dedicate their time to their home, reinventing it every day. We know the feeling and therefore decided to write this fantastic article on temporary wall decorating especially for people like you who just like us, are fond of decorating. Does the temporary word excite you? For us it does too as it means that change is imminent and change is something that we have already agreed that we enjoy! The décor world is not only about taste but about modifying the techniques, materials and even the tricks as your taste evolves. The tips that we bring you today are not entirely new, but they are undoubtedly a result of this evolution. Well then, if you are willing to give a new face to the walls of your home and continue this journey with us, you will see that we have great suggestions to give you! Mirrors are a decorative accessory that work well on any wall. These days mirrors are trendy and funky, but they also add another advantage—they make the space appear larger. 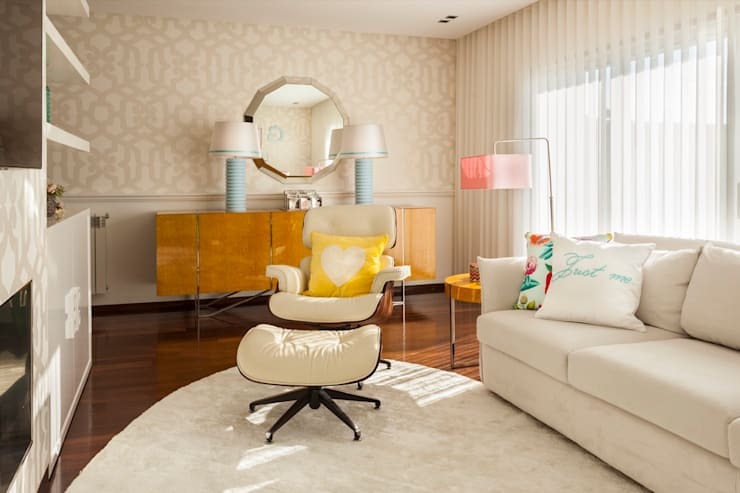 In this example, by Interdesign Interiors in Portugal, this room is not exactly small, however it features a wall with a pattern on it. The mirror breaks this up, adding edge and depth to the wall in the room . The wall stickers are our first suggestion—not only are very popular, but they also create an entirely new approach to the space. In this example we've chosen a minimalist example of wall decor where stickers make the wall more lively and dynamic. The images of fluttering dandelions are of unparalleled beauty and are simply poetic, forcing even the most distracted visitor in the house to stop and take note. 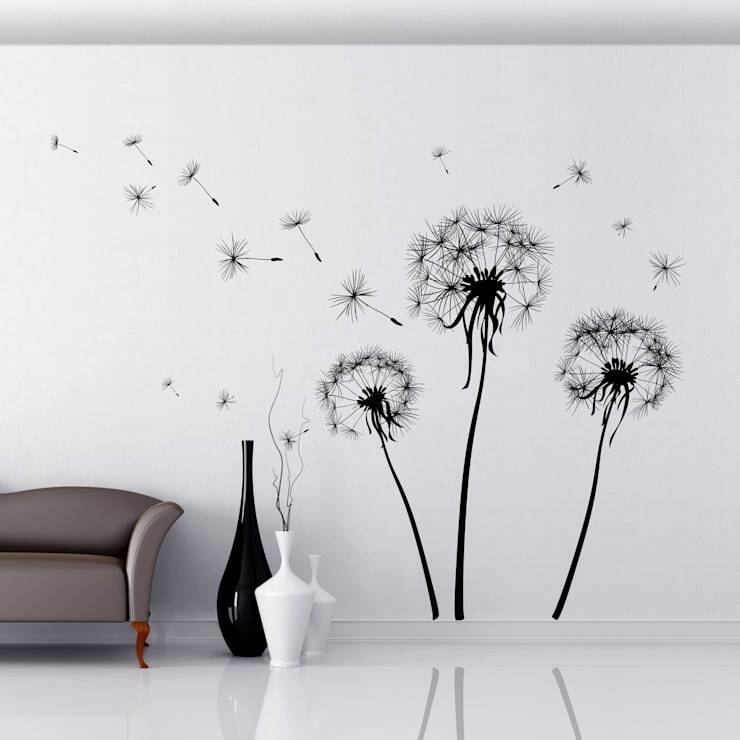 As you well know, this is just an example and there are thousands of wall stickers available, allowing you to choose the one that suits your home decor and your personal style. This allows your whole space to—temporarily—be redecorated. 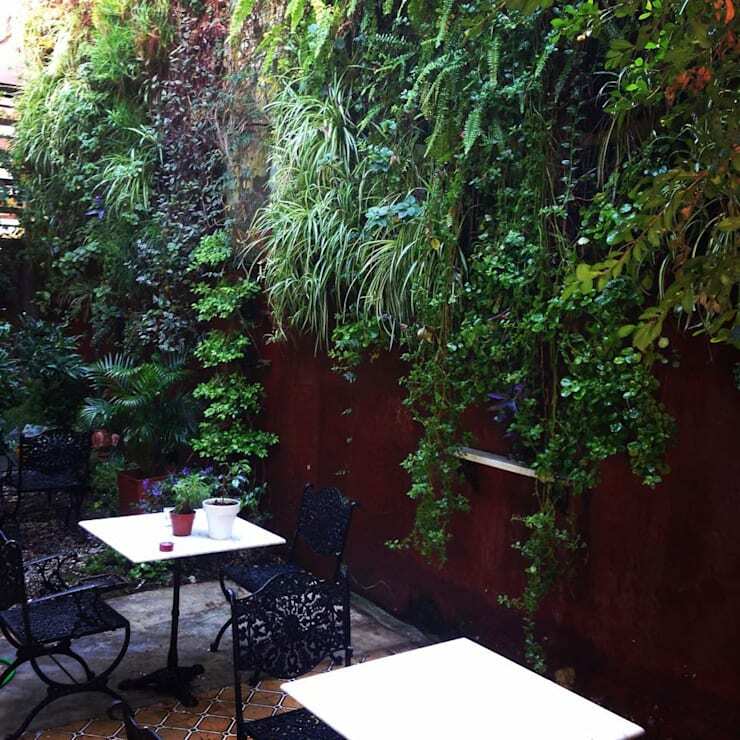 Vertical gardens are super fashionable and the world is starting to realise this! Inside or outside the home they are always a breath of fresh air and a piece of life that is part of our daily lives. As for us, we have to confess that we are big fans of these gardens and there are several reasons why. With a vertical garden, not a single inch of space is robbed but it turns out to be a very engaging form of decorating that makes us feel one with nature. Inside or on your balcony, a vertical garden can be the most gorgeous temporary decoration—although it may become a permanent features as we are sure that you will fall in love with it—and inspires you to feel a sense of peace and harmony. Plants, flowers or any form of fauna are possible in a vertical garden, but just be conscious if it is outdoors or indoors as not all plants adapt equally to light and dark. Then you can start building your garden. The process will be gradual but as you watch your plants growing above you, you will gain great satisfaction. Still within the range of stickers, we now present you with stickers for tiles. The principle is exactly the same, but for obvious reasons the stickers are smaller and designed to fit the shape of the tiles. 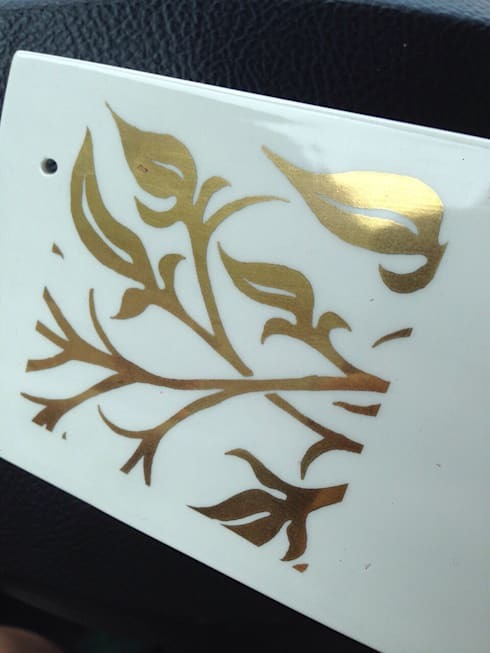 In this picture we see a white tile with a gold sticker, which easily adapts to different decorative styles. 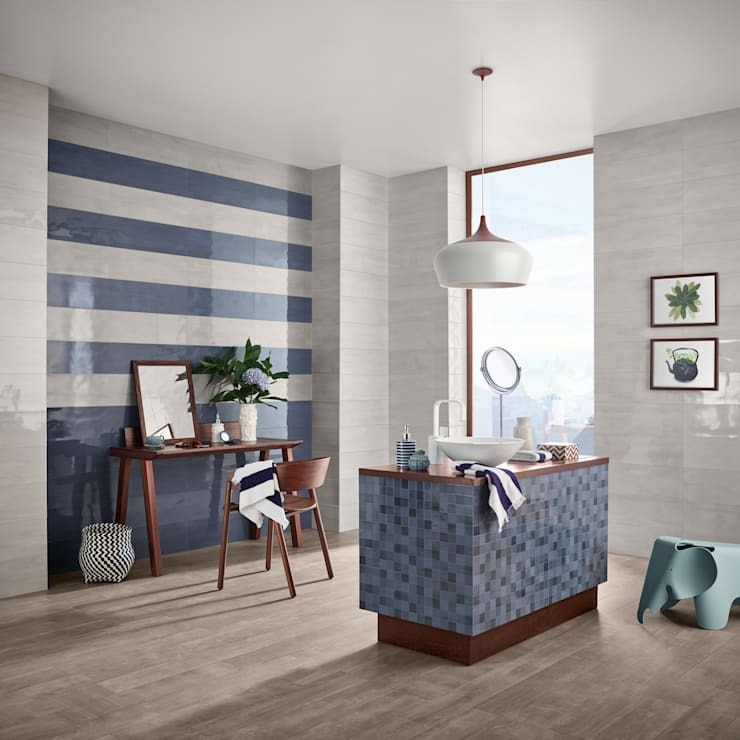 The most valuable aspect of these stickers is that they allow us to play with the various tiles on the walls, since we can choose the sequence that we like. Think geometric shapes or a multitude of designs—whatever comes to your imagination! What do you think? A great idea, right? The paintings hanging on your wall are a classic decorative feature. And the truth is that these are always beautiful and fill the walls with life and memories, yet we are suggesting sprucing up this type of decoration. There is a whole a new approach, using illustration blackboards on the walls. Remember the blackboards in your school days? It is more or less that we are talking about! Notice in this example, by Vinyl Impression, a round surface where chalk written words make this blackboard a decorative accessory that is super cute and makes for a modern wall. Another way to achieve the best decor results is to go old-school—yes that is exactly like your school blackboard! This is reminiscent of drawing in colored chalk just like you did when you were a child! There isn't a more fun way to decorate. An even more temporary solution is to change the writing on the board every few days, creating a completely different look and feel! Opt for modern décor and let yourself be surprised by the incredible results! This doesn't mean leaving out the classic picture frames and this image is dedicated to them. As we said earlier, pictures on the walls are one of the most popular solutions when it comes to temporary decorating and this is an incredibly traditional form of decorating. The truth is that nowadays there are picture frames more funky and fantastic than ever before. Frames don't just work for pictures but they can also work for mirrors. In this image that we see, we have precisely two types of uses for these frames. None of the frames displayed imposes too much in terms of space, however, there could not be a better choice as they work perfectly with the surrounding area. The great advantage of these types of frames is that there are so many different types of frames available so it will not be difficult to find the perfect type for your home. So at the end of day—think out of the box—we leave you another suggestion: buy a a very fine frame that is so large that it draws attention and place it on the wall.However, don't frame anything, keeping it blank—you will see the result is truly amazing! Now that you have the perfect temporarily decorated space, you should also know that: It’s Possible To Impress A Partner With Your Home. Are you tempted to try of these ideas in your home? If you do, we'd love to hear how it goes!